Several US Republican leaders expressed Saturday their crowing worries that Republican Presidential candidate John McCain was heading for defeat, according to a New York Times article. Party leaders said in interviews, one after another, that while they still believed that McCain could win over voters in the several weeks before the election, they were concerned that the Senator and his advisers seemed lost in their attempts to deal with an extraordinarily challenging political situation and the Wall Street crisis. Republican leaders appealed to McCain again and again to reinstate stability in his presidential candidacy and settle on a clear message to counter Senator Barack Obama. The past week has been particularly difficult for the Republican campaign due to the disclosures about McCain's running mate, Alaska Governor Sarah Palin's abuse of power in trying to orchestrate the firing of her former brother-in-law, a state trooper, and signs that McCain himself was struggling to find the right direction. The top Republican leaders cited by New York Times include Saul Anuzis, the Republican chairman in Michigan, a state where McCain has decided to stop campaigning, Tommy Thompson, a Republican who is a former governor of Wisconsin, Robert A. Gleason Jr., the state Republican chairman in Pennsylvania, John C. Danforth, a retired Republican senator from Missouri. As McCain's advisers said they remained confident of victory, McCain himself acknowledged the challenge Saturday while campaigning in Iowa. Iowa, where President Bush won narrowly in 2004, is crucial for McCain since polls now show Obama with a healthy lead. The New York Times article further talks about continued signs of confusion and turmoil in the McCain campaign and his aides struggling with conflicting advice, daunting poll numbers and criticism from state party leaders, who say that McCain has been damaged by several rallies last week in which supporters shouted insults and threats about Obama. 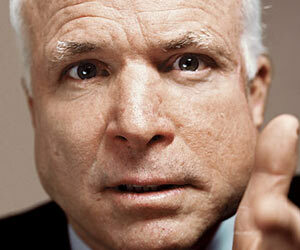 The insults even prompted McCain to reproach audience members on Friday night. However, the subject that has divided Republicans the most and created the worst disagreements became Obama's connection to William Ayers, a former member of the Weather Underground with some insisting that McCain hits the issue hard and others saying it would be a mistake to go down that road. McCain's campaign did bring up Ayers through accusations of Obama's connections with terrorists, coming from McCain's running made Sarah Palin, but now the campaign appears to step back a bit in raising that relationship, according to the New York Times. In the meantime, McCain suffered another blow when Democratic Congressman John Lewis, considered one of the key figures of the civil rights movement, accused McCain's campaign of "sowing hatred" against opponent Barack Obama. Lewis said the "sowing of seeds of hatred and division" reminded him of Alabama Governor Wallace's rhetoric in 1963 that was blamed for a church bomb attack that killed four young girls. McCain, who recently said Lewis was one of his most admired Americans, called the reference "beyond the pale". "I am saddened that John Lewis, a man I've always admired, would make such a brazen and baseless attack on my character," he said.